Solidarity Space and Bklyner are hosting a number of in-depth forums for the Public Advocate. 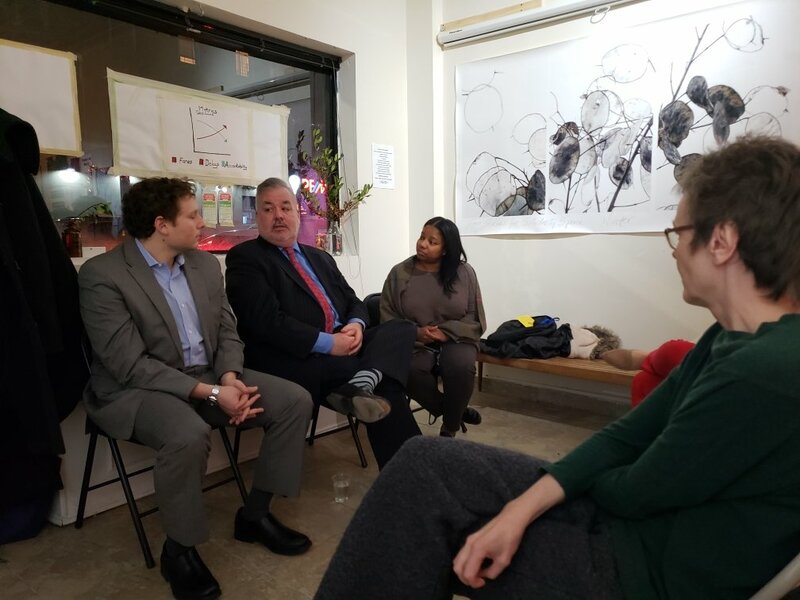 Assemblyman Danny O’Donnell, from Manhattan Valley, Morningside Heights and the Upper West Side joined residents for a conversation about his values, experience, and vision for the office of Public Advocate. O’Donnell wrote and passed the Marriage Equality Act, and would support the Public Advocate being granted subpoena power. He emphatically does not want to run for Mayor. Assemblyperson Danny O’Donnell visited Solidarity Space on January 10th, and spoke about his views on and ideas for the office of Public Advocate. Kadia Goba and Ross Barkan moderated the talk, focusing on affordable housing and Assemblyperson O’Donnell’s tactic of downzoning in order to get concessions from developers. The audience asked questions about education, climate change, justice reform, and more. Unfortunately, both Solidarity Space’s and Radio Free Bay Ridge’s mics cut out near the end of the talk, but we have about 48 minutes of audio covering most of the session, ending with a dialog about Community Boards. During the hour-long discussion, Danny spoke about his life, both as a gay man growing up in NYC and as a politician. Often humorous, Danny didn’t shy away from taking shots at Mayor DeBlasio, and Governor Cuomo, vowing to be independent from both. He was adamant that he was not seeking the Public Advocate as a spring-board to Mayor. The talk often dealt with affordable housing, returning many times to Danny’s downzoning strategy. It theoretically works by reducing the zoning density of an area and only raising it for specific developers if they agree to community board demands such as affordable housing. The tactic has met with mixed success, as pointed out by Kadia and Ross, the moderators. Danny also answered questions about ethics reform. As a lawyer, Danny had multiple criminal justice reform ideas. Like many Public Advocate candidates, he wants to see the office’s power expanded. His proposal is to give the Public Advocate subpoena power. Supporting climate initiatives was also a big talking point, such as green roofs, solar panels, the Harbor Ring project, and the Climate and Community Protection Act. We have already posted audio from Jumaane Williams and Rafael Espinal, with more to come soon! Be sure to be notified of their newest forums on their events page. This episode was recorded at Solidarity Space, a community space in Bay Ridge, Brooklyn. Recording is by Solidarity Space and Rachel Brody. Post-production and editing are by Daniel Hetteix.